(CNN) JERUSALEM - When asked on Saturday evening about a report that he told Secretary of State John Kerry and US Ambassador to Israel Dan Shapiro "not to ever second guess me again" on how to deal with Hamas, Israeli Prime Minister Benjamin Netanyahu did not deny them, choosing instead to say the report didn't reflect the general "tone and substance" of the calls. "First let me make a general statement about our relationship with the United States," Netanyahu said in English when an American journalist asked about the report from the Associated Press' Matt Lee. "I think the United States has been terrific." 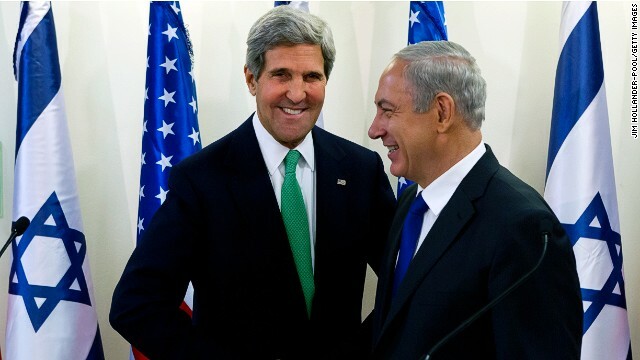 Netanyahu then praised President Obama's "unequivocal stand with Israel on our right to defend ourselves," as well as the "untiring efforts" of Kerry, called Shapiro "a great ambassador," and thanked Congress for passing an additional $225 million for the Iron Dome defense system. Some Israeli officials believed the attempt by Kerry and the United Nations Secretary-General Ban-ki Moon to broker a cease-fire with Hamas, the militant group that controls Gaza that the U.S. government considers to be a "terrorist" organization, was ill-conceived. Ninety minutes in the 72-hour cease-fire passed before Israel accused Hamas of breaking it, with an attack on Israeli soldiers through one of its tunnels. Though in public officials tend to sing from the same song sheet, there is a clear behind the scenes tension between the Obama and Netanyahu administrations about many issues, sources tell CNN, including whether Israel's current military operations in Gaza are excessive and resulting in preventable civilian deaths. In his press conference, Saturday night, the Israeli prime minister attempted to lump in the Associated Press report, which neither American nor Israeli officials have denied, with a supposed transcript of a phone call between Obama and Netanyahu that has been widely rejected as bogus by officials in both governments. "There is a lot of support and we deeply appreciate it, and that is the substance of our relationship, that's the tone of our relationship, which gets to the question of these reports that are not only of my conversation with Ambassador Shapiro but also with the President that are full of incorrections, full of distortions and are wrong in both tone and substance."